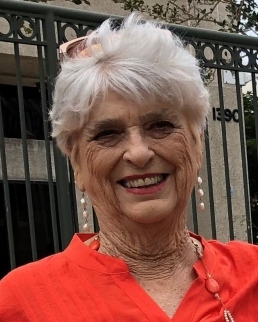 Memorial services for Mrs. Dorothy Jo Hess Whaley will be conducted at 1:00 PM on Wednesday, February 6, 2019 at Trinity Episcopal Church of Marshall. Celebrating the service will be Father Andrew Ellison. Visitation will be from 5:00 PM until 7:00 PM Tuesday evening at Sullivan Funeral Home. Dorothy Jo Whaley was born July 26, 1936 in Marshall to Blanch Rogers Hess and Lewis “Bubba” Hess. She was a 1954 graduate of Marshall High School. After high school Dorothy went on to attend Kilgore College where she was a Kilgore Rangerette, serving as a lieutenant. She danced at many events, including the Cotton Bowl, and won the College Caper Talent Show! She graduated from Kilgore College in 1956. Dorothy was always a real beauty, winning Miss Marshall and finishing 4th runner up in the Miss Texas Pageant. Although she didn’t win Miss Texas, she was proud that she won the swimsuit contest! Dorothy went on to attend Texas Christian University where she studied dance. She joined the June Taylor Dancers in New York, a professional dance troupe who performed a high-kicking Broadway based routine the first three minutes of the Jackie Gleason Show. Dorothy married Pete Whaley on November 28, 1959, at Trinity Episcopal Church where she was a faithful member and spent countless hours volunteering and serving on the alter guild. Together she and Pete raised to adoring children, Terri and Paul. Her beauty on the outside was nothing compared to her beautiful heart. She was a full-time caregiver to her husband Pete, but always found time to help others. Dorothy had many loves, including sewing, crafting, shopping, travelling, golf and tennis. However, her biggest love was her large circle of friends! Dorothy was preceded in death by her husband, Pete; her parents; and brother, Lewis “Hoss” Hess. She is survived by daughter Terri Whaley Teter and husband Steve; son, Paul L. Whaley, III and wife Tammie; aunt, Mary Jo Magers,; sister-in-law, Patty Whaley; nephews, Tom Whaley and wife Teresea, Ben Whaley and wife Tamme, George Whaley and wife Anne Marie; niece, Shelley Hess; and a host of very close friends. Serving as pallbearers will be Randy Wilson, Kyle Wilson, Mark Reynolds, Paul Reynolds, Ben Craig and Larry Craig. Dorothy’s family would like to thank the nurses at Good Shepherd HomeCare and all the beautiful ladies who loved and cared for her during her illness. In lieu of flowers please make donations to the Trinity Episcopal School at 2905 Rosborough Springs Road, Marshall, TX 75672, St. Jude Children’s Research Hospital at www.stjude.org, or to the charity of the donors choice.